The Telsur Project is a survey of linguistic changes in progress in North American English, supported by the National Science Foundation and the National Endowment for the Humanities. It is the creator of the Atlas of North American English [ANAE], (formerly, the Phonological Atlas of North America). The Atlas will be published in 2005 by Mouton/de Gruyter. It will be accompanied by a CD-ROM version developed by a team headed by Prof. J�rgen Handke at the University of Marburg, creators of The Mouton Interactive Introduction to Phonetics and Phonology . The maps and analyses presented on these pages include early studies that provide the background of the Atlas, and new studies continue the work of the Atlas. A complete revision of Chapter 11 of the Atlas of North American English. This chapter defines the major dialects of North America on the basis of the status of the low short vowels /*/ and /o/ and the active chain shifts and mergers. Other draft chapters are available in the Table of Contents of the Atlas of North American English. The sampling of the major urbanized areas of the United States is complete, and the phonemic categories of 700 subjects have been analyzed on the basis of minimal pairs and other elicited forms. Maps of these results appear below in the Maps section. Acoustic analysis of 417 speakers has been completed and draft chapters in the Atlas 11 and 18 are based on the 140,000 measurements involved. Regional maps of the Inland North are available where the phonological characteristics of the Northern Cities Shift may be examined in detail, with identification of each community and speaker. Clicking on any symbol will show the basic merger data for that speaker, and for the six speakers shown with stars instead of circles, the personal data sheet also lists words with characteristic vowel qualities. Clicking on these words will enable to hear the sounds of the Northern Cities Shift. For all speakers, the sounds of sample words illustrate the advanced pronunciations of short a, short e, short o, and short u. For some speakers, an extended sample of speech, as long as 60 seconds, is included, so that you can hear the Northern Cities Shift reflected in spontaneous speech. The Organization of Dialect Diversity in North America . A brief summary of impressionistic and acoustic findings is presented in a paper given at ICSLP4 in 1996. A National Map of the Regional Dialects of American English, by William Labov, Sharon Ash and Charles Boberg. 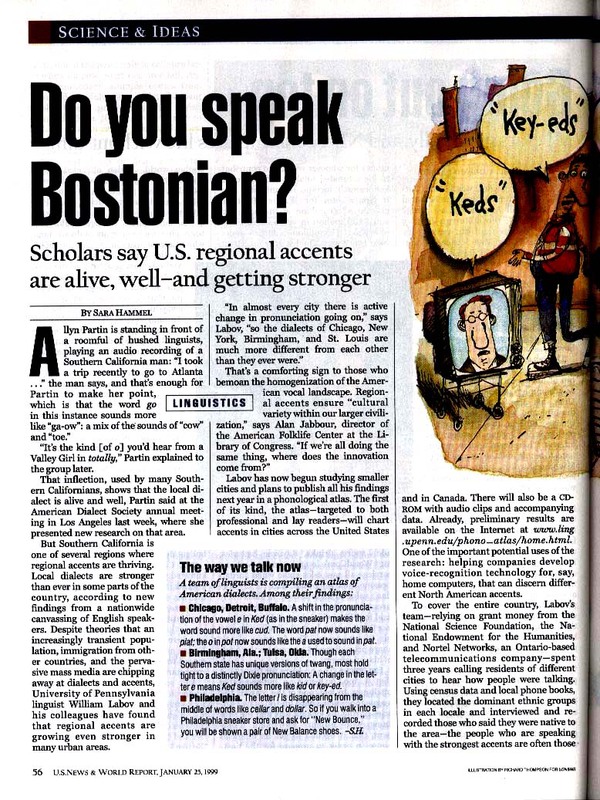 This paper presents the overall results of the Telsur Project in responding to the question, "How many dialects of American English are there?" and "Where are the boundaries located?" It is based on the acoustic analysis of 240 Telsur interviews carried out so far, with further data from the impressionistic analysis of the full sample of 640 speakers representing urban areas. Map 1 of this paper shows the dialect boundaries of the regions, with the distribution of the defining features. The body of the paper presents the rationale for this choice of features, and the degree to which other phonological features coincide with the defining set. Each regional map gives full identification of the cities and informants within the region. These are large maps that require scrolling to view their full extent. Clicking on the informant symbols for any labelled city will link to a page with full demographic information for that informant and data on perception and production of six variables undergoing merger in North America. Sampling methods of the Telsur Project. 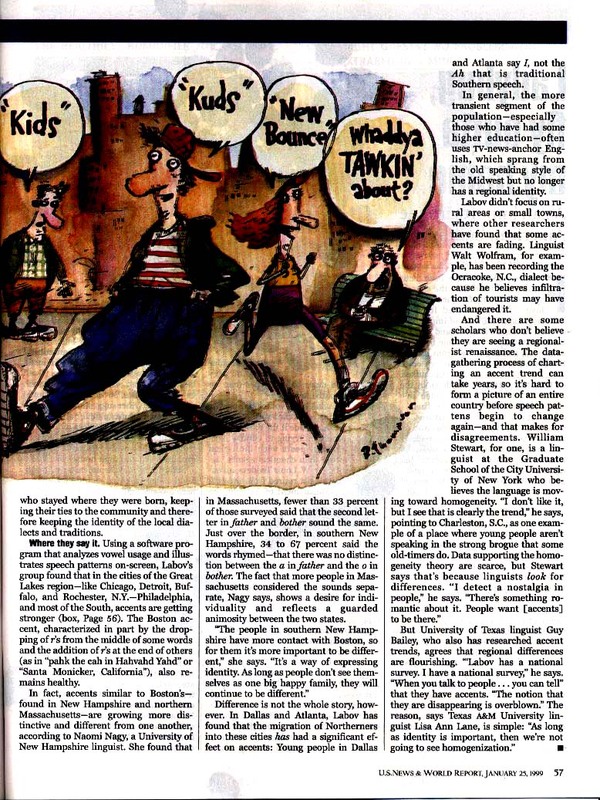 New Yawk Talk March 12th NPR interview of William Labov on his 40-year study of the various accents of New York City. In Search of the First Language Transcript of March 1997 Nova television program on PBS. Map 1. The merger of /o/ and /oh/: invariant responses in production and perception. Map 2. The merger of /o/ and /oh/: advancement of the merger before nasals. Map 3.The merger of /i/ and /e/ before nasals: invariant responses in production and perception. Map 4 . The merger of /il/ and /iyl/. Map 5 The merger of /ul/ and /uwl/. Map 6 A comparison of the /i/~/iy/ &/u/~/uw/ mergers before /l/. Map 7 The merger of /e/ and /ey/ before /l/. The contrast of /hw/ and /w/. Map 8 The maintenance of the /hw/~/w/ contrast. The Phonological Atlas is designed to give an overview of the current development of North American dialects in urbanized areas, and to provide the basis for more detailed studies of particular areas. We are interested in hearing from the readers and users of the Phonological Atlas on which phonological features should be given more detailed treatment, on errors and inconsistencies in our records, and your own contributions to the problems of explanation and analysis outlined in our articles. Please send comments and questions to William Labov (labov@central.cis.upenn.edu) directly or use the following form.